On April 3, 2015, Anaheim Police were involved in a separate incident with Mr. Anderson when an officer observed a suspicious subject climb over a wall in the 2800 block of E. Lincoln Avenue. The subject, later identified as Paul Anthony Anderson, ran to a truck and quickly drove away. Believing a crime may have just occurred, the officer initiated a traffic pursuit when Anderson failed to yield. The officer lost sight of the truck on the 57 freeway in the area of Yorba Linda Boulevard. 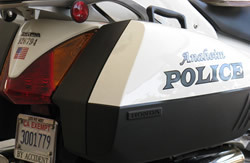 A short time later, an officer with the Placentia Police Department located the vehicle and pursued the truck until Anderson crashed at a construction site near Chapman Avenue and Orangethorpe Avenue, where Anderson was taken into custody for California Vehicle Code §2800.2 - Felony Evading. Anaheim Officers learned that officers from the California Highway Patrol attempted to serve an arrest warrant for Mayra Frausto at the same location Anderson was seen running from. Frausto was not located inside the residence, however, a large quantity of marijuana was observed in plain view. Anaheim officers completed and executed a search warrant based on their observations, and seized over 15 pounds of marijuana. Anderson was linked to the dwelling, and an additional allegation of §11359 Health & Safety Code - Possession of Marijuana for Sales was added to his booking charges. Anderson was transferred to Orange County Jail yesterday evening, where he later posted bail in the amount of $25,000. Booking photos for Anderson and Frausto are attached below. All further questions related to this incident should be directed to the Orange County District Attorney’s Office.